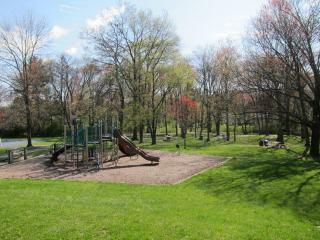 This 7.4 park has a shaded picnic area, restrooms, swing set, playground, basketball court, softball and baseball fields. A wooden bridge connects the baseball fields to the rest of the park across a small stream. A paved path through the park provides walking and bicycle access between Grover Street and the adjacent Princeton Shopping Center, where there is also lots of parking.